UPDATE!!! Kathya received her bedroom makeover during the weekend of January 16-17, 2010. Both her and her sister Jamie were amazed with the results and are enjoying their new space very much. In fact, Kathya is quite the popular hostess lately. She has been having her friends over from school to spend afternoons of fun in her bedroom – something she never did before! Kathya is a beautiful 20-year-old girl that is extremely affectionate and loves to give and receive hugs! She currently attends a New York City District 75 school and will be graduating next year. Kathya has an angelic face that is a radiant beam of light and she is very loved by the students and staff at the school. In fact, Kathya cannot make it ten feet down the hallway without a staff member stopping her and telling her how pretty she is and admiring her beauty. She expresses her gratitude by shining light on all of those who interact with her with her brilliant and sparkling smile and her large and expressive, loving eyes. 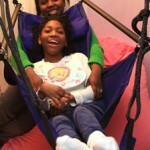 Kathya is challenged with cerebral palsy, spastic quadriplegia type (which means all four of her extremities are affected). She is unable to walk but she possesses the cognitive function and enough fine motor control of her left hand to operate a motorized wheelchair, which she routinely uses to navigate the school environment and community. 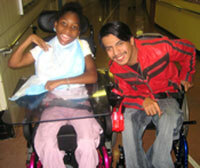 Having a motorized wheelchair has increased Kathya’s independence and her self-esteem has soared since she obtained it. However, the wheelchair breaks down at times and she has to be pushed in a manual wheelchair while it is repaired. Kathya is non-verbal but has excellent receptive language skills and is extremely bright. Although she is unable to speak, if you are around her for even a short period of time, you will hear her unstoppable giggles and squeals of laughter when she gets excited about something. She answers “yes and “no questions by nodding her head or shrugging her shoulders. She has an electronic communication system she uses at times to help with expressing herself in the classroom, or she answers straightforward questions by using a spelling card by pointing to the letters to spell out her answer. Kathya is also able to write with a pencil independently and can answer simple questions in that manner. Kathya is dependent for all activities of daily living, such as transitioning to and from her wheelchair, toileting, bathing, dressing, etc. She has limited voluntary movement of her upper extremities, left greater than right, however enough fine motor control of the fingers of her left hand to perform the skills described above. In addition, with set-up, she can hold an eating utensil in her left hand and bring it to her mouth to feed herself. Kathya has limited purposeful movement of her lower extremities. She can be positioned on an adaptive Rifton bicycle and pushed by the therapist while she steers with her left hand. In addition, she can continue propelling the bicycle using her legs independently in a straight line for approximately 20 feet if given a push start. 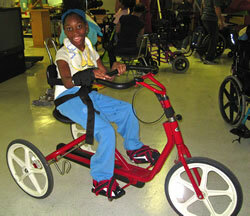 She is working on being able to propel and steer the bicycle simultaneously, which is very challenging. She also likes to be positioned upright in a stander and/or gait trainer so she can be eye level with her peers. 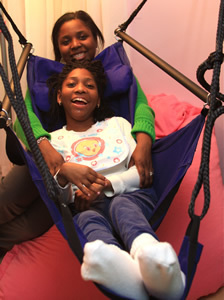 Kathya is able to sit upright with support, but not without. When positioned on her back on a mat, she can roll on to her stomach and back in either direction, but is unable to obtain most other developmental positions. Kathya is a loyal and adoring fan of Hannah Montana – whether it’s her music, movies or just about anything Hannah Montana related. So it is only fitting that Hannah Montana will be a major theme for her bedroom. She lives with her mom and older sister in an apartment in the Bronx. Kathya’s loving and sweet demeanor is a product of all the years of devotion, care and loving kindness that they have surrounded her with. Both her mom and sister work full-time and Kathya has the help of a home attendant after school. Kathya shares her bedroom with her sister Jamie. As usual, Jamie is putting Kathya’s happiness first and has agreed to allow us to transform their bedroom into a Hannah Montana dream room. Please take a moment to view the Before and After photos of Kathya's bedroom, as well as the bedroom makeover process. 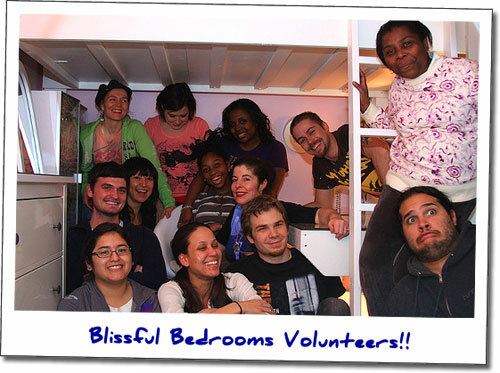 Thank you to all of the dedicated and committed volunteers who contributed to Kathya's bedroom makeover! 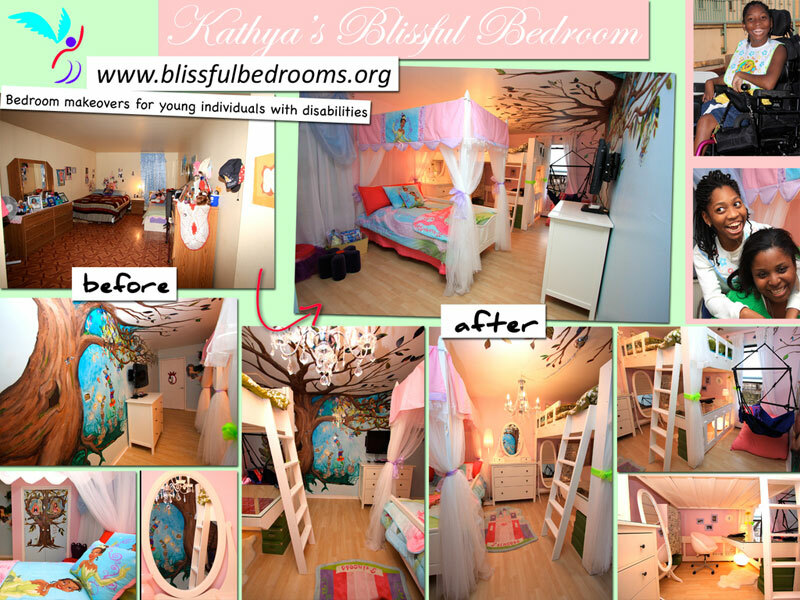 Thank you to all the generous organizations and people who have supported Kathya's bedroom makeover!